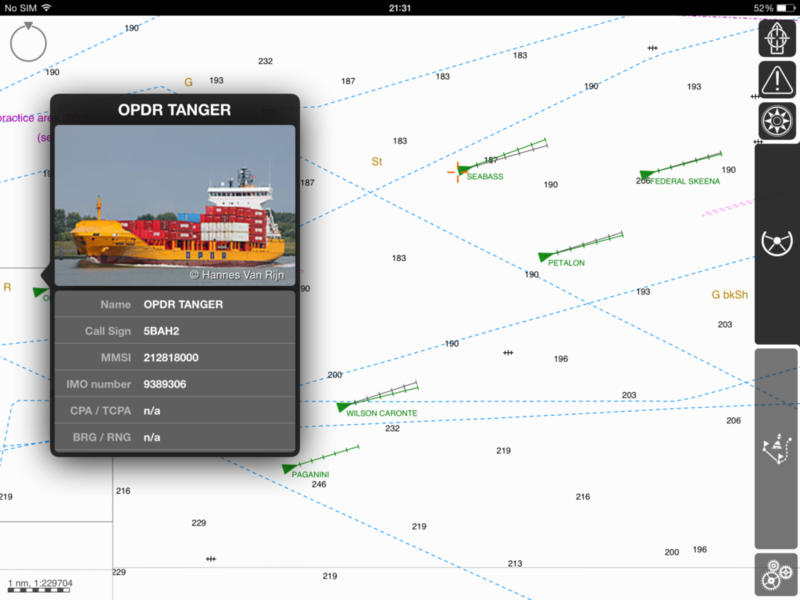 Pocket Mariner’s real time AIS data and photo API service has been selected by Transas , a global leader in marine navigation systems, to use with their iSailor iPhone and iPad app. 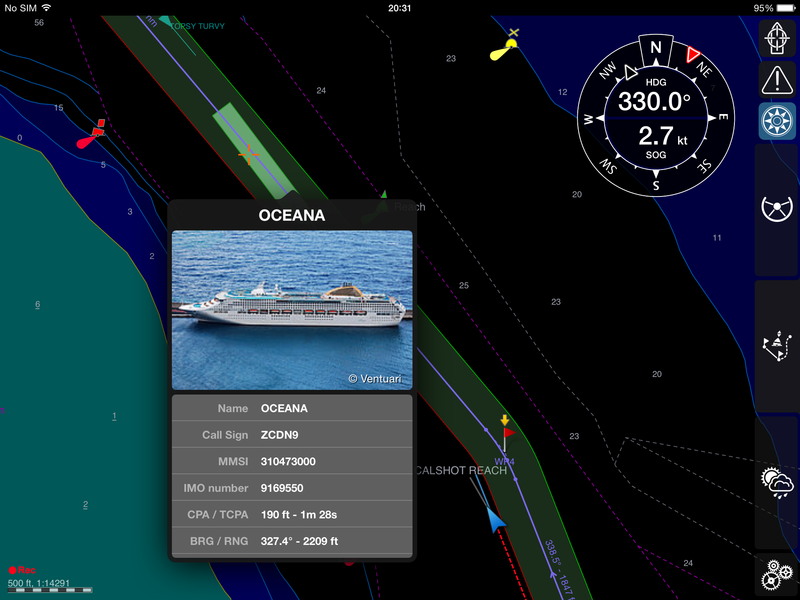 The latest version 1.7.0 of their app now provides a real time map view of ships around you with instant details including name, range and bearing together with a photo of the ship to help you recognise it. Mikhail Andrianov, Product Manager at Transas says “We are really excited to provide our Transas iSailor users with live AIS data on their charts via the Internet. Pocket Mariner’s live AIS API, SDK and sample code made integration with our product easy and fast. This option makes it possible to show on charts the next AIS target types: AIS Class A, AIS Class B, AtoN (Aids-To-Navigation, virtual or real), Shore Base Stations. This functionality will be useful for users of different kinds: from sailors, boaters or water tourists, – who have no AIS Class B or receivers on board to ship owners, dockers and marine logistics personnel, who need to monitor vessel traffic in a given area. To use this functionality, you will have to have WiFi, 3G or 4G/LTE internet access on your Apple device.” Steve Bennett, Pocket Mariner’s CEO commented: “This is another great endorsement of Pocket Mariner’s “real time” AIS data service and API’s that we use to power our own Marine Navigation Apps and we look forward to providing additional AIS data services enabling Transas’ iSailor users to share their boat’s position and course in real time using our internet AIS transmit and track api’s”. 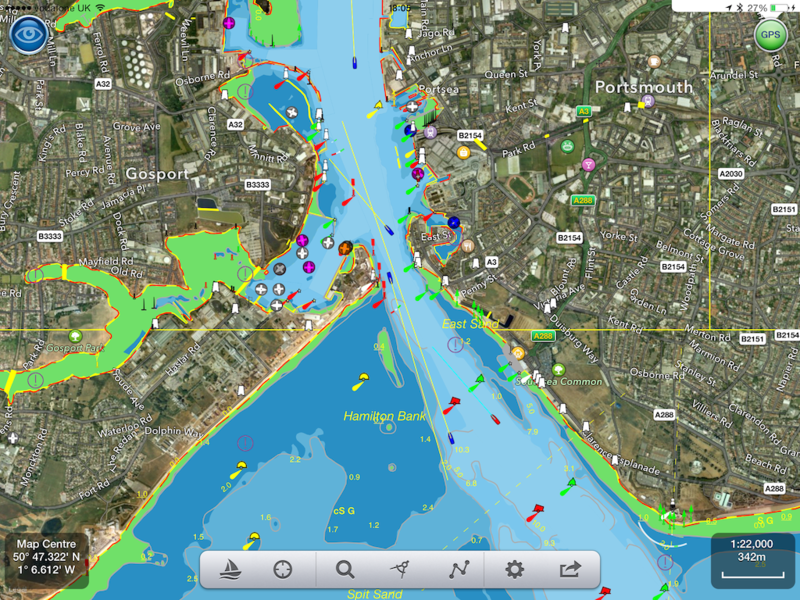 Pocket Mariner’s real time AIS data service, FleetWatch, has been selected by the Pilots at Portsmouth International Port to use with their Portable Pilot Units (PPUs) running SevenCs ORCA Pilot G2 solution. The Pilots use Pocket Mariner’s real time AIS data feed to display live ship positions and courses on and around their client’s ship as they travel out to pilot it. Ben McInnes, Deputy Harbour Master and Portsmouth Pilot said: “The real time internet AIS feed allows us to “virtually board” the ship and assess the situation before we even get there.” Portsmouth have also selected Pocket Mariner’s AIS Replay service to review and playback incidents and for training purposes. Steve Bennett, Pocket Mariner’s CEO commented: “This is a great endorsement of Pocket Mariner’s “real time” AIS data service that we use to power our own Marine Navigation Apps and we look forward to them using our additional AIS data services including geo-fence event triggering and instant history replay capabilities “. Please contact us at business@pocketmariner.com to learn more about how our FleetWatch and PortWatch service can help you. We have been working with IntelliWeather Inc. who have been developing an exciting new marine-rated rugged and waterproof navigation tablet device. The device is now launched and we are delighted they chose to build in our Boat Beacon AIS – Marine Navigation app to provide a fully operational AIS collision avoidance system. Here are some more details on this exciting new device. A new IP66 rated waterproof and dirtproof Android tablet for marine use provides an all-in-one solution at a fraction of the cost of traditional separate marine electronic devices. It provides navigation, AIS collision avoidance, weather radar, weather bulletins, communications, entertainment, and optional fish finder/sounding capability in one portable device. The NAVIOTAB+ tablet has been introduced by IntelliWeather Inc., a provider of weather instrumentation, weather display systems, and weather content and comes pre-loaded with ready to run applications and navigation charts for the United States. The user has options to purchase additional navigation charts for most regions of the world provided by Navionics. In addition, in an agreement with PocketMariner of the United Kingdom, the NAVIOTAB+ comes ready to use with a fully operational AIS collision avoidance system. Making use of the built-in GPS and Internet connectivity capabilities to provide a real-time AIS radar like display of vessels near your position in highly trafficked ports and navigable waterways worldwide. This provides an extra level of accuracy and protection allowing you to “see and be seen” with or without MMSI registration. The NAVIOTAB+ also comes equipped with free weather radar plots and weather bulletins in the USA, including marine weather bulletins. The data is provided free by NOAA and has no subscription requirements. All that is required for live weather radar data and live AIS is an Internet connection via the built-in 3G/4G data capability of the NAVIOTAB+. This can be via a SIM card and most any cellular data carrier that supports a “bring your own” plan for connectivity. Alternately, NAVIOTAB+ can communicate via any 3G/4G capable cellphone that is WiFi hotspot enabled, or any other WiFi Internet connection. When equipped with a SIM card and cellular data/voice plan, users can initiate and receive telephone calls using the built-in speaker/microphone, earphone, or use a Bluetooth enabled speaker or headset like they would with any cell-phone. Web browsing, email, and MMS messaging are also standard features. As an entertainment system, NAVIOTAB+ provides a built-in FM radio tuner as well as streaming music services such as Pandora Internet Radio (free) and Sirius XM radio (subscription). Both come installed and can be operated without external antennas. Movies can also be played from streaming services such as YouTube, Netflix, Hulu, and others as well as locally stored files. 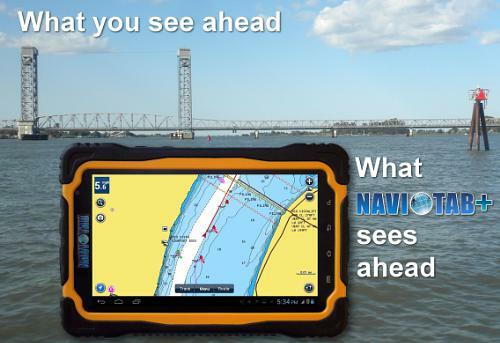 Unlike traditional marine electronics, the NAVIOTAB+ is not married to your boat, it can be taken “on the go” anywhere as a regular tablet and can also serve as an automobile navigation system via the built-in Google Maps application. To round out the features, with the addition of a DEEPER Bluetooth enabled transducer, fish finding, water temperature, and depth sounding capability can be added to the NAVIOTAB+. A powerful 10,000 mAH Lithium-Ion battery provides operation which can exceed 8 hours. The tablet can also be continuously charged/powered directly from your boat via the included Blue Sea Systems marine rated 12 volt cigarette lighter to USB power adapter and the included USB power cable. Sporting a Quad-core 1.2 GHz A9 processor, 1 GB of RAM, and 8GB of FLASH storage, the NAVIOTAB+ is fast and responsive. Storage can be expanded up to an additional 32GB with insertion of a micro SD storage card. The bright 7″ screen is protected by toughened scratch resistant glass and can be seen in daylight, plus offers automatic dimming for night use. The built-in GPS receiver system does not require an external antenna, and is accurate to within 3 meters (10 feet). Weighing just 1.36 pounds, NAVIOTAB+ is easily portable, and easy to secure to windshields, dashboards, and rails with a wide variety of readily available tablet mounting systems. It also comes with a palm rest/strap to enable portable use. Tally up and compare the cost of all the separate marine rated devices that are replaced by the NAVIOTAB+ and you’ll understand why it makes the most sense for the recreational boater that doesn’t want to spend a fortune on getting their boat equipped. For the professional mariner, NAVIOTAB+ also makes a great backup system for your bridge, or as an emergency navigation system. The NAVIOTAB+ has a manufacturer’s suggested retail price of $649.00. For further information these resources are available.